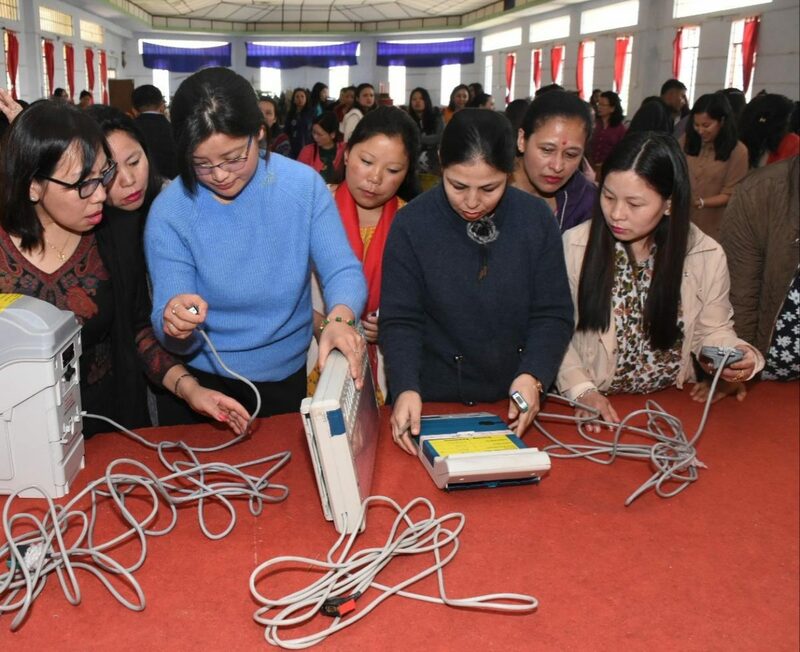 Namchi, 08 Apr (IPR): Five day long ‘third round of training for Presiding and Polling Officers’ for South district which was held simultaneously at Community Hall and auditorium of Namchi Girls Senior Secondary School concluded today. The master trainers for the training were Mr. Hemant Rai, Mr. Bimal Chandra Rai and Mr. Jigme W. Bhutia alongwith various election officials. Master Trainer, Mr. Hemant Rai informed the trainees that adequate assistance should be provided to voters under PwD and senior citizens. He updated that these officials should also be aware that the Electronic Voting Machines (EVMs) from this year onwards will also include Braille signage feature for the differently-abled voters to exercise their franchise. He added that the basic minimum facilities like wheel chairs, ramps and necessary equipments will be available for the PwD voters in all the polling stations in the district. Mr. Rai further urged the attendees to be well versed with the rule book issued by the Election Commission of India and emphasized that they should also pass on reports to be filled by them in the beginning, during and ending of the polls. Similarly, master trainer Mr. Bimal Chandra Rai explained in detail the functions of Voters Verifiable Paper Audit Trail (VVPATs) which he updated is being introduced and will be used for the first time in the ensuing General Elections in the state. He said that one of the key characters of VVPAT is that once a vote is cast on the EVM, the information will be displayed on the VVPAT machine and the vote will be visible to the voters for seven seconds after which it gets stored in the machine. The trainer also briefly expounded about the importance of mock poll which he said should commence an hour prior to the actual polls and that there should be no paper slips during the process of mock poll. He elaborated that mock polls has to be recorded for issuance of certificate and for better transparency and the data of the mock poll should be deleted before the official poll starts. He also spelt out the various roles and responsibilities that the presiding and polling officers need to follow such as being inclusive in nature, preparing documents, managing complaints, closing of polls and sealing of EVMs. During the course of the training the election officials also spoke about the android application named ‘Poll Star’ which should be downloaded by the officials as this app is meant to monitor the various important activities pertaining to polling stations during the poll day.